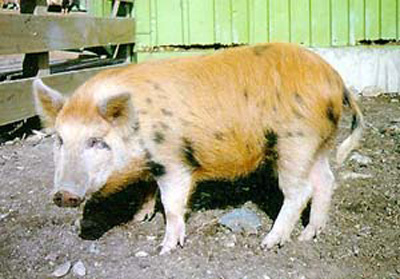 Arapawa Pigs are a large hairy breed. They are either a tan or sandy color with black patches. Arapawa Pigs are a feral breed of domestic pig found on Arapawa in the Marlborough Sounds of New Zealand, where they have lived since 1839. The boars weigh 120-180 kg, and the sows 80-100 kg. Although there are suggestions that the animals are descendants of pigs introduced to the area by James Cook in 1773 and 1777, it is more likely that their ancestors were released by whalers in the early 19th century.